Two very different operas, written less than half a century apart, were staged on successive evenings at the Opéra Bastille last week. The operas of Russian composer Nikolai Rimsky-Korsakov (1844-1908) are all too rarely performed outside of Eastern Europe, so it was a rare delight to have the opportunity to see his third and favorite opera, The Snow Maiden (premiered in 1882), at the Opéra Bastille under the guidance of two Russians, director Dmitri Tcherniakov and conductor Mikhail Tatarnikov. Based on the play by Alexander Ostrovsky (whose plays are still widely performed in Russia but seldom in the West), the opera serves as an intriguing foretaste to the ballet The Rite of Spring (1913) by Rimsky-Korsakov’s fellow countryman Igor Stravinsky: both works depict weird happenings as spring turns to summer and involve the sacrifice of a virgin. Whereas Stravinsky’s version famously caused a riot at its Paris premiere because of its atonality and orgiastic rhythms, Rimsky-Korsakov’s musical idiom is less confrontational, springing from traditional folk melodies, woven into a unified whole that works well on stage. The opera’s prologue opens with the Snow Maiden’s parents, Grandfather Frost and Spring Beauty, agreeing to allow their daughter the Snow Maiden, who is entranced by the sound of human song, to join the human community of the Berendeyans. The only problem (plot spoiler alert!) is that if she experiences love, she will melt with the arrival of the summer sun. Much of the opera revolves around the Snow Maiden’s interest in the singing shepherd Lev (intended by the composer as a cross-dressed alto role but performed here with panache by Ukrainian counter-tenor Yuriy Mynenko) and the planned marriage between Kupava (sung with shimmering theatricality by Martina Serafin, last seen on the Parisian stage as Elsa in Lohengrin) and Mizgir (Thomas Johannes Mayer), who himself falls in love with the Snow Maiden and abandons his fiancée. Kupava seeks vengeance through the intervention of the czar, who gets some fabulous music to sing; it is a pity that tenor Ramón Vargas withdrew from the role at late notice, as his replacement, Maxim Paster, lacks the vocal heft of his fellow singers. The absolute star of the show, though, is Tatar soprano Aida Garifullina (whose parents must have predestined her to an operatic career from the moment they named her) as the Snow Maiden. Winner of Placido Domingo’s prestigious Operalia singing competition in 2013, Garifullina is in superlative vocal and dramatic form here; there is a thrilling intensity to her voice, which sits somewhere between coloratura and lyric soprano. Tcherniakov’s decision to set the story in the present day, with modern Berendeyans coming to the forest to reconnect with their ancestors’ traditions, works well on the whole. The prologue, somewhat perplexingly, is set in a ballet rehearsal room (with Spring Beauty directing children cast as birds of the forest), but this theatrical metaphor is not sustained with any coherence during the rest of the opera. 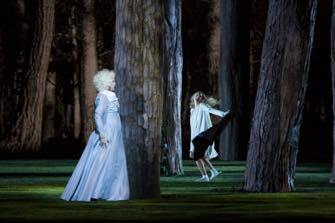 The contemporary setting dissolves into the timelessness of the forest in the final two acts, with huge trees dominating the vast Bastille stage; the moment that the trees start revolving as the Snow Maiden walks through the forest with her mother is truly magical and shows Tcherniakov’s talents as both director and designer at their best. His operatic instincts, however, are less sure, as his decision to stage most choral (and many solo) numbers with the majority of the singers’ backs to the audience diminishes vocal impact considerably. That said, Tatarnikov’s assured and idiomatic musical direction of the orchestra of the Opéra National de Paris makes for a very satisfying evening musically, with Garifullina’s extraordinary performance alone well worth the ticket price. Christoph Marthaler that first appeared at Bastille in 2008. Based on a play by Georg Büchner, which Berg saw at its first performance in Vienna in 1914, Wozzeck concerns the travails of an everyman figure in a post-psychoanalytical age, a man mocked by his peers, experimented upon by a callous doctor and cheated on by his girlfriend, Marie. The opera (performed without an intermission) is in many ways a one-hour-and-45-minute howl of anger against the inequities of the world. While the poor cannot enjoy the wealth and privileges of bourgeois society, they are still expected to adhere to its moral codes. Hence Wozzeck and Marie are ostracized and abused for having a child out of wedlock. But this is not just a modern tale of angst; the many biblical references and the centrality of storytelling point toward much more ancient traditions. A look back at the review I wrote at the time this Bastille production was first staged shows how much one’s perception can change. The last time, I hated the setting of Marthaler’s version in the canteen or restaurant of some kind of sports complex and was disappointed not to see a stronger representation of the blood-red moon that rises just after Wozzeck has murdered Marie and drowns himself. This time, it hardly seemed to matter. I also complained previously about the distraction of children in the background playing on bouncy castles. But this time I recognized how crucial such seemingly inconsequential visual interferences are to the agonizing ending of the piece: the children playing in the background are the same ones who sing with insouciance at the end while the child of Wozzeck and Marie plays by himself, oblivious to the fact that he is now orphaned. They are the ones who inherit the chaos wrought by their dysfunctional parents. 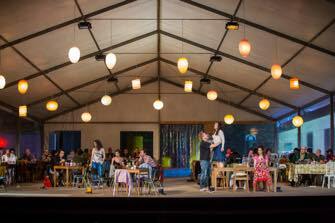 The decision to place the children at tables in the canteen, staring at the audience during the devastating final orchestral interlude (performed with extraordinary power and passion by conductor Michael Schwønwandt and the orchestra of the Opéra National de Paris), was genius on the part of the director. The singing in this production is excellent throughout, but Gun-Brit Barkmin’s vulnerable yet tenacious Marie and Johannes Martin Kränzle’s brokenly dignified Wozzeck are exceptional. If you want an evening of pretty tunes, this is not the opera for you. Otherwise, make sure you don’t miss this rawly unsentimental and searingly unsettling work (and its production, I now have to admit).